I was so excited to get my package from Tomoson last week in the mail. I had signed up to do a review, and have been waiting for it to come. As soon as I saw the white tube in my mailbox, I knew that The Chalkboard Tee had finally arrived!!! YIPPEE!! The new packaging that they use is really awesome; it's a white tube, which is so easy to reuse and can be crafted into many useful things. Inside the tube, they included a "How-to" sheet which is basically an instruction manual for your Chalkboard Tee. It gives you simple instructions on how to use your shirt, offers suggestions for reusing your tube, and even give ideas for reusing your shirt after you've grown out of it! 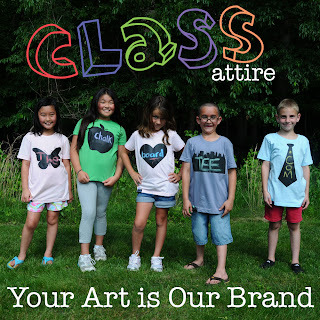 The Chalkboard Tees have five most popular styles: Light Blue Tie, Grass Skyline, Light Pink Heart, Red Apple, and Light Pink Butterfly. The Chalkboard Tee is the coolest thing since, well, ever! It's a chalkboard on a shirt, but it's as soft and flexible as a regular printed tee. Plus, you can write, draw, erase, and repeat. There's even a pocket for your chalk, the Chalk-It! Check out their website today and receive $9.00 off of your order when you use the code Class61739. Discount codes are not case-sensitive and will expire on April 1, 2011. Also, you can follow them facebook under the name: The Chalkboard Tee and "like" them for more updates and promotions. The Chalkboard Tee is so great they also are giving one of my readers a chance to win one of their own as well! Just leave a comment stating which Chalkboard Tee you would love to win and you're entered!! This giveaway will end on Feb. 1, 2011 at 11:59 CST. I will choose a winner using http://www.random.org/ and will notify the winner by email. 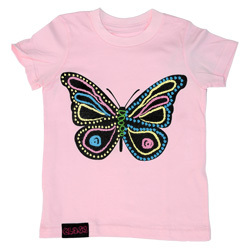 I think Kat would love to have the pink butterfly t-shirt.